Support the artist and BUY THE ALBUM HERE from the wonderful people at eThaiCD.com. You can shop for your Thai CDs entirely in English and contact them in English. There is one perfect, shining song on this album, the title song, “Wan Waan Mai Mee Kow, Wan Nee Mai Mee Row.” [If Yesterday There Wasn’t Her, Today There Wouldn’t be Us]. Khun Aed explains that he was inspired to write this for his mother and for all mothers; that all mothers are saints to their children. This emotional tribute is delivered so earnestly, just the singing voice brings tears to the eyes, but, as always, the lyrics are more amazing than the tune. I don’t know about all mothers, but my mother was a saint, and so apparently was Aed’s mother. (Since her death, he is often seen wearing a T-shirt with her picture). According to this song, mothers teach us to “fly against the wind.” Another line that reduces me to tears: “Just seeing her, young men and women can fly off to the distant shore of their dreams.” Oh, and the song doubles as a tribute to the band Carabao and their community of fans. “Kow” in the title can mean “him/her” OR “horns” as in the hand signal: \m/. So the main meaning of the title is “If yesterday there wasn’t her [our mothers], today there wouldn’t be us.” But the second meaning is “If yesterday there wasn’t the buffalo horns [ \m/ ], today their wouldn’t be us [the community of fans].” That’s kind of cool! 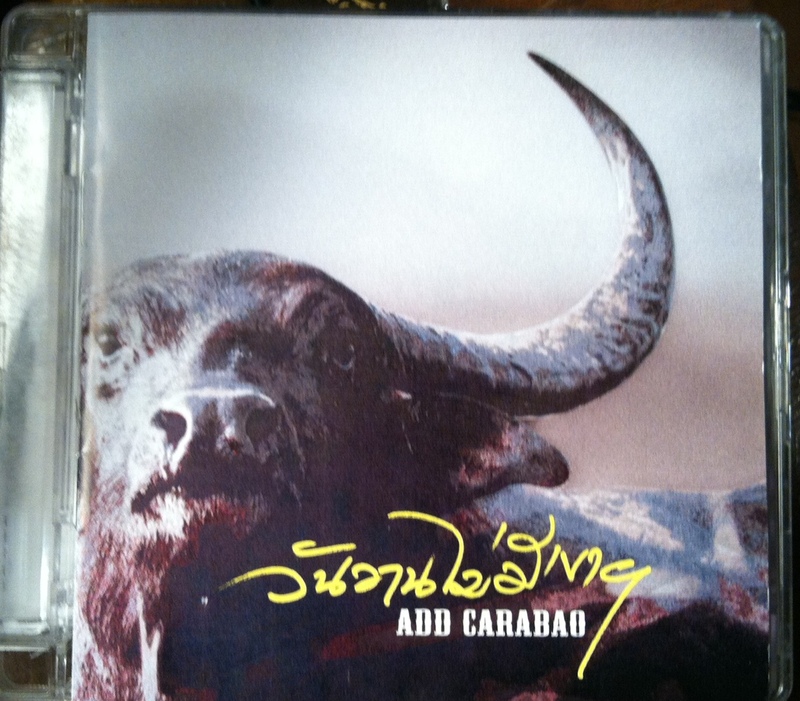 The second most-interesting song on this album is a song honoring Aed Carabao’s friend Ron Amero, a Canadian who moved to Thailand, set up a bar in Pattaya where Lam Morrison would play (Lam Morrison is the Thai musician honored in an older Carabao song “Guitar King”). Ron rode motorcycles with friends in the band, and even travelled with them on tour for a while. Right before dying of cancer, Ron asked to be buried on Aed’s property (in Sattahip) so he could be near his friend. And Aed said yes!!! So Ron is buried on Aed’s property!! This is a rousing country song (it even ends with a “Yee-Ha!”). It tells a happy story: Ron is buried near his friend Aed, where it is warm, and “they can watch the stars together”; and so in some sense, “Tiger Ron will never die.” Once again, Khun Aed sings some lines in English. Alas, Khun Aed speaks English about as well as I speak Thai, so the results are less than perfect. Or maybe the muddled pronunciation is fitting, as this song explains a cross-cultural friendship that took place despite the problems of language. The challenges of communication are even mentioned in the song. Both the story and song reflect the artist’s openness of heart to this whole complicated, muti-faceted world—a quality this farang highly appreciates in all of Aed’s work. 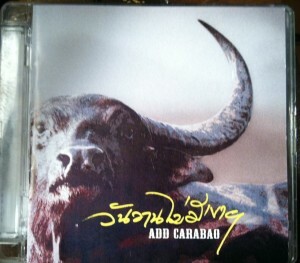 This is the second solo album Aed Carabao has released within a one-year period. The last album, improbably titled, “Gan Chon Ma” or “Dog Bumper” deserves to be a classic alongside early Carabao albums. (I reviewed “Gan Chon Ma” [กันชนหมา] earlier). Almost every single song on that album (with the possible exception of the title song) was wonderful, and I described that album as “soothing to the soul.” This album does not rise to that level. It seems to be a collection of pretty good songs by a composer who can’t stop creating and experimenting—and wants to share whatever decent material he has with the fans. Several of the songs on this album sound like covers of English-language songs that I heard in the 1970s or 1980s, but I can’t quite remember their names. [Edit: One is a cover of “Four Strong Winds” made famous by Neil Young–just the tune, with totally different lyrics.] One song [ไม่อยากทน] that does have an original-sounding tune begins with a line that translates, “I don’t want to talk about it anymore.” I know from the internet, that Khun Aed has recently been singing (very beautifully) the English-language song, “I Don’t Want to Talk about It” by Danny Whitten. My theory is he got hooked on this song, and felt inspired write something in Thai with a similar theme. One song on the album is called “0 = 1”. It has a catchy tune, and may have great lyrics as well. I don’t know because I’m not able to follow enough of the words, or maybe I don’t understand the particular metaphor being used. “Baan Suan Chaingmai” [บ้านสวนเชียงใหม่] is a pretty country song, with some Hawaiian ukulele thrown in, about going home to Chaing Mai, where he birds are always singing and people are relaxed. The final song on the album is a very simple, meandering song that has the feel of a live recording. In fact, it feels like we are listening to Khun Aed compose a song on the spot—like he is making up the words as he goes along. If I am hearing the lyrics right, he is asking the fans to “Come Sing a Song” with him in some utopian, heaven-like place where there is no crying, there is only singing, and all is well, and it’s like this forever. It ends with the lyrics, “la, la, la, la . . . la, la, la, la.” It’s a peculiar song, very plain, and I can’t decide if I like it. But it does capture the essence of Aed Carabao, “the man who has the breath of music”: He is continually singing and composing, as if he can’t stop. Anyway, his fans are hoping this is the case.